For the one-semester course in Principles of Macroeconomics. 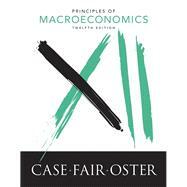 Reviewers tell us that Case/Fair/Oster is one of the all-time bestselling Principles of Economics texts because they trust it to be clear, thorough, and complete. Readers of Principles of Macroeconomics, Twelfth Edition come away with a basic understanding of how market economies function, an appreciation for the things they do well, and a sense of things they do poorly. With the latest research and added exercises, readers begin to learn the art and science of economic thinking and start to look at some policy and even personal decisions in a different way. Professor Fair’s research has primarily been in the areas of macroeconomics and econometrics, with particular emphasis on macroeconometric model building. He also has done work in the areas of finance, voting behavior, and aging in sports. His publications include Specification, Estimation, and Analysis of Macroeconometric Models (Harvard Press, 1984); Testing Macroeconometric Models (Harvard Press, 1994);Estimating How the Macroeconomy Works (Harvard Press, 2004), and Predicting Presidential Elections and Other Things (Stanford University Press, 2012).